Hey there! Thanks for dropping by Make Your Own Game! Take a look around and grab the RSS feed to stay updated. See you around! So you’re looking to build a game similar to 1942 right? Well with Pulado it is pretty easy to build a scrolling shoot ’em up (aka shmup) like this. Games like this are also called bullet hell games because there are so many bullets flying everywhere. 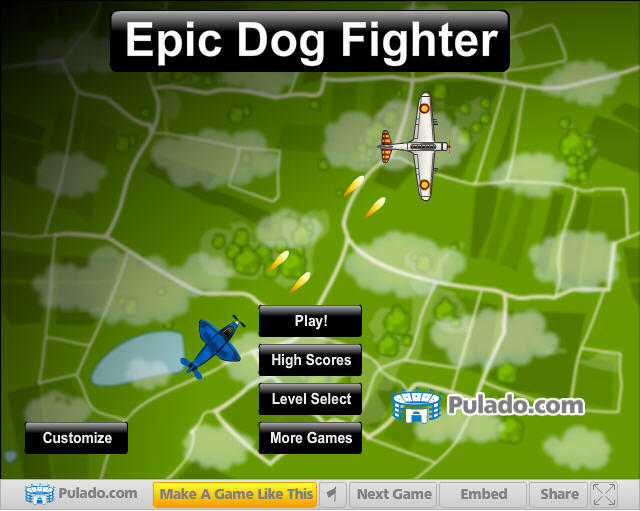 Pulado comes with a simple template called Epic Dog Fighter which contains all of the ingredients for you to create a similar game and then tweak out to your hearts content. The first thing you should go is go to the Pulado Members area (if you don’t have an account you can sign up to make your own games first) and click the New Game button. 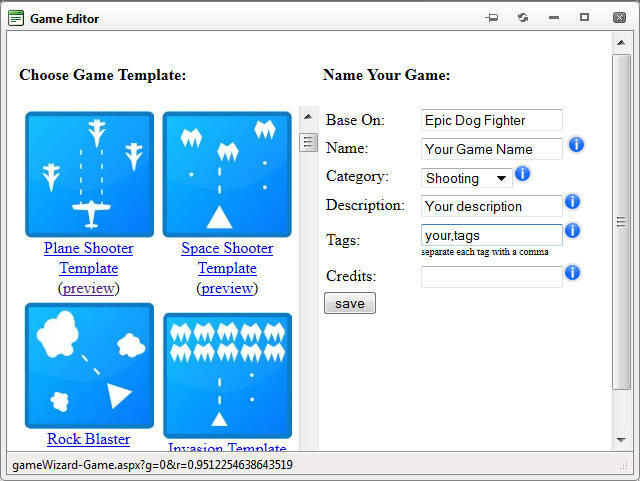 Select the “Plane Shooter” template and then fill in the name, description, and tag fields with those items for your game. Once you have created your own game using this template you can now select your game from the list and you will be able to preview the existing game. When you are ready you should click on the Player tab to start tweaking your game. 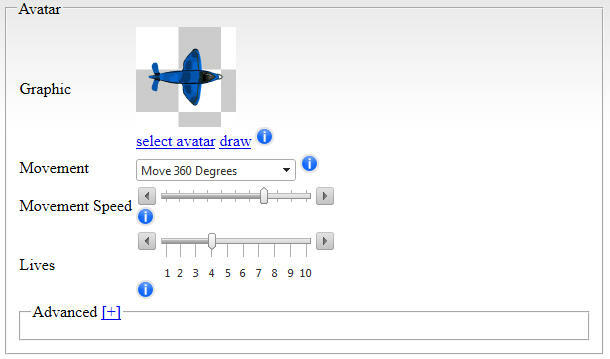 The first options to tweak out are the player character (which in this case is a WWII fighter plane). You can change it to a different avatar or leave it the same. You can also increase or decrease the player movement speed and how many lives they have when they start the game. You can probably ignore the Advanced section for now. Next up you can configure the weapon #1 and weapon #2 for your fighter plane. Weapon #1 is controlled by the CTRL key and weapon #2 is controlled by the X key. Think of Weapon #1 as your machingun and Weapon #2 as your powerful bomb weapon. In the weapon sections you will have Weapon #1 set to Bullets, the graphic set to some bullet graphics, and you can also configure the rate of fire and projectile velocity. 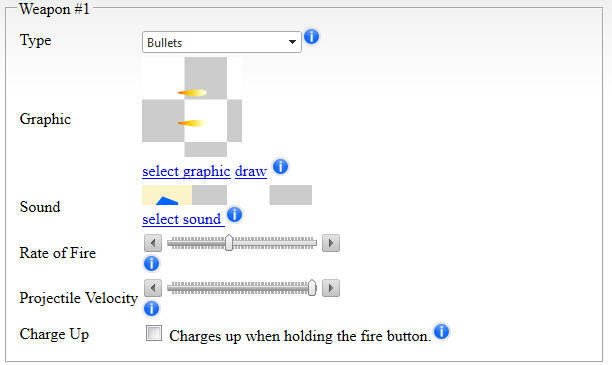 With the Bullets type it will loop the graphic animation over and over until the bullet leaves the play area at which point it will despawn. 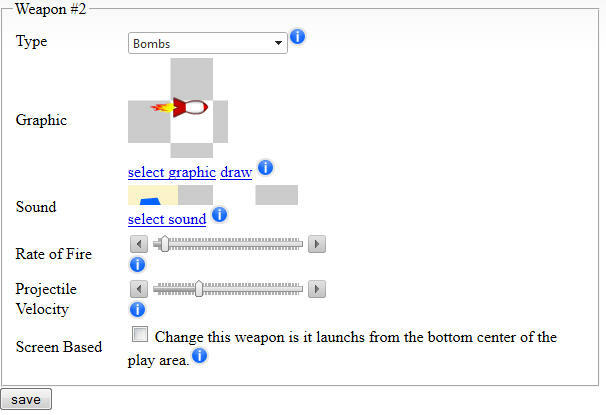 For Weapon #2 you will want to have the Bombs type selected, a bomb graphic selected, and you can set the sound for the bomb. 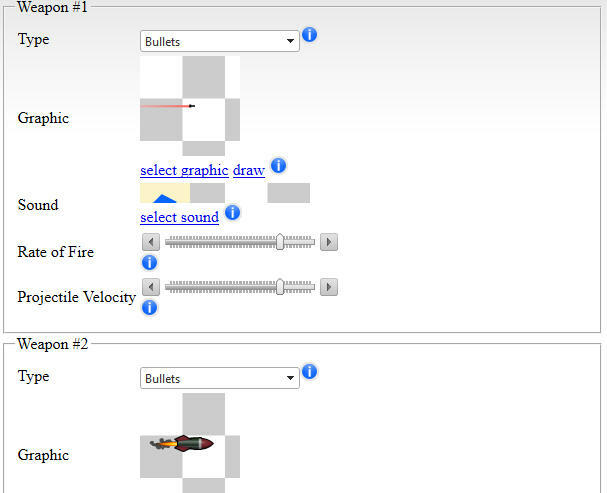 Additionally you can also set the projectile velocity and rate of fire of the bombs as well at this point. When you select the Bombs type it will load the graphic that you select (usually a SWF file) and it will play it until the end of it’s animation at which point it will disappear. After you have made any changes make sure to click the Save button at the bottom to lock in the changes. Next up you will want to edit your opponents for this shmup game. In this case we have a bunch of different opponent planes. With this game type we have the Complex Falling movement type selected. Complex Falling will use all kinds of different movement types combined together. Each time a different opponent spawns they will get a different movement type to give you a very dynamic game and keep the players on their toes. You can also set the opponent movement speed, how many opponents to start the game with, and how many opponents can be alive at the same time. Once the Max Concurrent Enemies is reached no more will spawn until one despawns (dies or flies off the screen). Also keep in mind with this section that under the Advanced area you can select One Enemy graphic or Multiple Enemy graphics. If you select Multiple Enemies the engine will randomly choose a frame from the animation and use it as the enemy each time a new enemy is spawned. Within that one keyframe you should have a looping MovieClip. If you have One Enemy selected it will just play that single MovieClip animation repeatedly and spawn it for each enemy. The last piece of information about the Multiple Enemies option is that the last frame in the list of keyframes will be used as the Boss graphic if you turn on Bosses in the Gameplay tab. The Weapon #1 and Weapon #2 section for the Opponents is pretty much the same as for the player. With the exception that Weapon #2 will fire at angles out to the side of the opponent instead of being a screen clearing bomb like the player’s weapon #2. 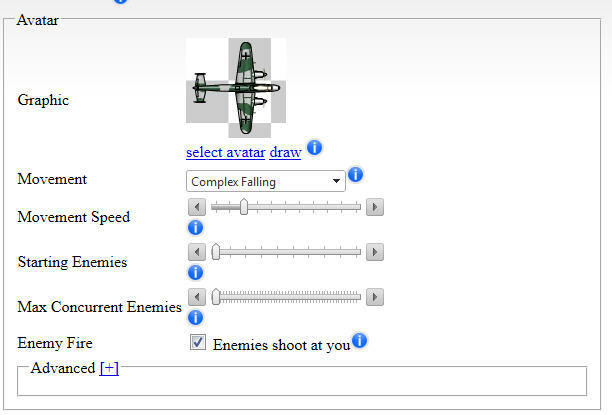 Again you can configure the rate of fire and projectile velocities of the opponent weapons plus their sounds and graphics in this section if you like. If you made any changes in the section be sure to click the Save button at the bottom to lock in your new settings. And one of the final things we want to show you which is important for this kind of bullet hell game is the Powerups section. Click on the Powerups tab in the Pulado game creator and from there you will be able to select which types of powerups you would like the player to be able to collect while they play the game. You can choose from things like rapid fire, multifire, extra lives, and more. You want to make sure that Multifire is selected because that will contribute to your bullet hell game. Each time you pick up a multifire powerup you will start firing an extra stream of bullets (up to 6 or 7 streams). If you die or you pick up some other type of powerup like Rapid Fire you will go back to just one stream of bullets again. 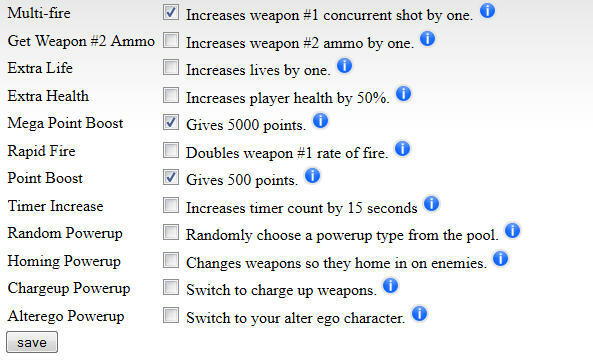 You could also check the boxes for Rapid Fire and Homing powerups if you like to give your game more variety. If you make any changes here click save to lock them in. That’s it! That is all there is to creating a basic game in the same style as 1942 and other similar scrolling shoot ’em up games. There are of coarse other options you can move on and configure as well like the Background tab where you can customize the look of the background graphics in addition to where, when, and how fast those background graphics will scroll. You can very easily create a parallax using the settings. Also don’t forget about the Gameplay tab where you can configure things like how many hitpoints the player and opponents will have in addition to things like opponent Bosses. You can now preview, publish, and promote your game. Keep in mind that you can come back at any time and tweak your game (even after it has been published). You game is hosted in the cloud for your convenience. 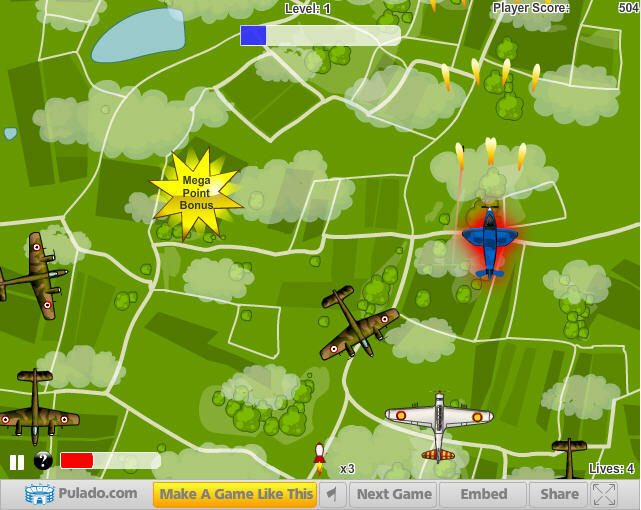 If you haven’t created an account on Pulado.com yet head over there and start making your own shmup game like 1942 right now using our make your own games creator. Click to create your own games today!